In his chamber music, Krommer followed the style of Franz Josph Haydn and Wolfgang Mozart, and yet his modes of expression extend from the galant style of the earlier 18th century to Romanticism. 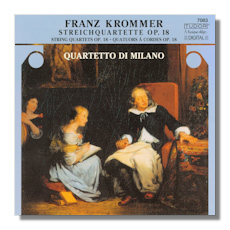 These relatively early quartets, published in 1800, show Krommer at the height of his Classicism. In all, Krommer wrote more than 75 string quartets, of which these are numbers 22 through 24.